David's Hopes For Docebo Inspire 2018 – GuyKat Solutions Ltd. In this brief Q&A session our eLearning Consultant, David Brannon, answers questions about his hopes for next week’s Docebo Inspire Conference in Toronto. GuyKat are proud sponsors of this event. What part of DoceboInspire are you most excited about? The Learning Awards! There’s a tonne of other things I’m excited about, but I really can’t wait to see who wins each of the categories. I’ll be crossing my fingers for a few of the finalists our team has worked with this year. We’ve helped get them up and running and doing awesome things on Docebo, and it’s been brilliant to see them roll-out their projects and then continue to push their platforms forward. They deserve recognition. But all entries are brilliant, and the judges are fiercely independent so we’ll see! Whenever there is any Docebo event there is always a great atmosphere – it will be fantastic to catch-up with the great people who work for Docebo. I’m also planning on catching up with some clients who are attending and hoping to meet some new people too! What are you expecting from DoceboInspire? I feel like there will be a buzz around AI (Artificial Intelligence). AI is being talked about everywhere, you just can’t get away from it. I remember attending a partner event a little while back and the CEO of Docebo (Claudio Erba) gave a compelling speech about how AI will transform the way we use learning technology. We’ve just seen Docebo make its first AI release with the 7.5 updates and I can’t wait to see how it will develop. If I get time to check out some of the sessions, I will certainly be making a beeline to hear from Ben Eubanks when he discusses ‘Artificial Intelligence at Work: What skills will tomorrow’s workforce need?’ (3 pm October 11th). 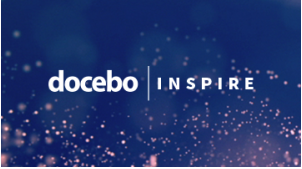 I’m hoping to meet Docebo users and hear their experiences – the networking at the Inspire events is a good chance to talk through familiar and sometimes unfamiliar use-case scenarios. I can learn a lot from other people’s experiences and also help others to see different ways of achieving goals. I’m also hoping that a recent addition to the GuyKat team (Joanne Payne – LMS Consultant) will get the chance to soak up the Docebo atmosphere and take as much out of the education sessions as possible at Docebo U. Where can we find GuyKat at DoceboInspire? Our CEO, Guy McEvoy, will be in the spotlight when he introduces bestselling business author Chester Elton at the keynote session in the morning on Thursday, October 11th. We will also be at the Learning Awards cheering everyone on! What can our clients expect to see and take away from this event? I think the key takeaways clients will really benefit from our education and experience. The Docebo U session is a great addition to the event, I’m sure sitting down with the Docebo experts will enlighten any admins using the system, you are bound to pick up some new tips and tricks. There’s also a lot of talks scheduled with experienced Docebo users – listening to their experiences will no doubt fast-track you to success with your own platform. Are you planning to do any sightseeing while you’re in Toronto?